There’s a fine balance in staying true to your roots yet continuing to innovate: settling into one groove generally pulls you out of another, and this is something that fly rod (among other) manufacturers struggle with on a regular basis. So you make fly rods, but how do you make an impression on a potential customer? One way is to make a fly rod that is just right for them. Easier said than done, but one fly rod maker is doing just that. Sage has settled into a comfortable groove as of late, churning out noteworthy, appealing, super-model-thin blanks that have garnered wide attention – and praise – for all the right reasons. Many of the latest releases like the Circa and Method are imbued with the things that the most demanding anglers insist on – power, smoothness and accuracy – but these two rods are miles apart in terms of what they offer in an overall package. I did this with the new ACCEL and the reactions were almost unanimous: everyone liked the rod’s feel, and it loaded beautifully and felt light in hand. Mending was often mentioned, and how expertly that could be accomplished with this rod. Two features that are immediate standouts on the ACCEL are its extra-sensitive tip – always a difficult component to get right, and the reel seat, which is coated to allow the up-locking ring a near-zero-friction spin. Remember Goldilocks wanting her porridge just right? The ACCEL was exactly that for the four other anglers who handled it. Balanced with the right reel this rod becomes an all-rounder. Targeting trout will make sense with this rod, as will targeting smallmouth or just about any other freshwater species that isn’t off the charts weight-wise (I tested a single–handed 4-weight). Jerry Siem, Sage rod designer, describes the new rods this way: The ACCEL are medium-fast and feature an added graphite hoop core and axial fiber material in the new Generation 5 technology which allows for a lighter, ultra-responsive, and livelier blank with a narrower shaft. The result permits anglers to feel the rod load for optimum casting control. Jerry uses “lively” to describe the blank, and the term is bang on. I’m certain that that’s what anglers appreciate most about the ACCEL. Simply put, a lively blank is a very big part of what makes fishing fun. Reels make great gifts. Flies make great gifts, too, as do fishing accessories, but I would never recommend giving a fly rod as a gift. Anglers must to go into fly shops to obtain the rod that’s best and that’s right for them. That said, I’d make an exception with the ACCEL because of its potentially broad appeal. If ten anglers were to receive this rod for their birthdays (just sayin’), I’d be stunned if there were more than one return. 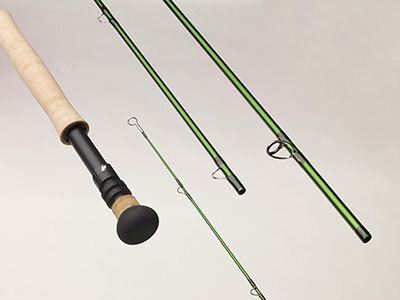 ACCEL single hand rods range in weights from 3 to 9 and are priced at $595. Switch rods come in weights 6 to 8 and are priced at $695. Spey rods are available in weights 6 to 8, for $750. Hardware specifications: Fuji ceramic stripper guides, hard-chromed snake guides and tip top complete the blank. Freshwater rods from 3-6 weights have a rosewood insert with stealth black anodized aluminum up-locking reel seat and a snub-nose, half-wells cork handle. Saltwater models from 6-9 weights feature a stealth black anodized aluminum up-locking reel seat and also feature a snub-nose, half-wells cork handle. All models come in 4-piece configurations.